Like the career arcs of many promising first-round draft picks, Madden’s next-generation games have steadily improved from unwatchable embarrassment to veteran excellence. Perhaps, then, we were expecting too much - or (more likely) the short development cycle allotted to Madden 09’s crew didn’t allow enough time for all their ideas to get fully implemented. Whatever the reason, while this year’s edition still rocks hard, it sports enough middling annoyances to hold it back from pigskin perfection. EA can hardly be accused of cashing in with a simple roster update and a couple of back-of-the-box “new and improved” bullet points, as there are loads of additions this year. The most impactful of these is the Madden IQ, which molds the play-by-play struggle on the field. We’re not math majors (therefore can’t profess to prove it), but all evidence suggests that EA isn’t just blowing smoke when they say your performance is constantly measured and the opponent’s play tweaked accordingly. With this setting turned on, each game became an epic struggle as our strengths were muted and weaknesses under-exploited. Thankfully, we could always switch back to “Pro” difficulty when we wanted to lay a beatdown on hapless opponents. That always feels good. Most of the other new bells and whistles combine to shine everything up to a glossy hue, from the players to the TV-style graphics whooshing across the screen. The long-disdained quasi-PA announcer calling the action is finally dead, replaced in the virtual booth by “real” commentary from Tom Hammond and Cris Collinsworth. Their blathering is hardly earth-shattering and often repeats, but it’s a positive addition. Collinsworth will also break down key plays in a stop-motion, neon-hued replay feature; it’s kinda nifty but after a few ooohs and ahhs it luster dims significantly. We were definitely hoping for some of our biggest gripes from last year to disappear, but unfortunately a few remain. While players become gloriously caked in mud during rain-soaked games, for some reason the field never changes a bit (to be fair, though, snow games look beautiful). Scorers often celebrate their touchdowns all by themselves as their teammates lumber toward the sidelines, and computer-controlled players regularly step out of bounds when danger is nowhere close. You can’t even pick different on-screen plays with the various face buttons (you can in Madden’s collegiate counterpart, NCAA Football 09). These complaints may sound like nitpicking - which we freely admit they are - but add ‘em up and the semblance of next-generation, immersive football is seriously crimped. 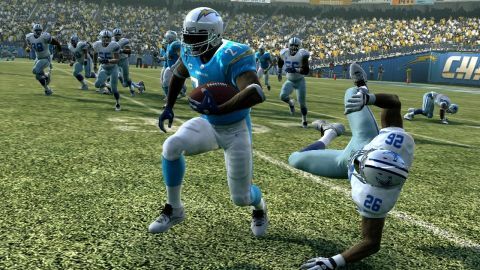 Without a doubt, Madden 09 is still a day-one purchase for gridiron junkies. We’ll happily play all season long, during which we’ll invent a thousand more reasons to love and hate it all at the same time. No matter what, though, we’d be lying if we said we weren’t a tad disappointed that this year’s version didn’t make the same jump we’d gotten accustomed to the last two years. We were ready for the ’73 Dolphins, but got the ’84 ‘Fins instead. Description Like a 13-10 overtime win, Madden 09 doesn't totally wow us but definitely gets the job done. Saddle us up for another season, even though we're a tad underwhelmed.